These valves are Manual Operated valves to regulate the flow anywhere from full open to fully close. These are designed specifically to accurately control the process. Improved sealing devices and highly accurate machining of the screw rod (stem) have provided tight shutoff as well as characterizable control. The design of the regulating element, which allows the stem holder to turn into the flow without any significant side loads. The linear action of the screw rod provides tight fit against the seal, which allows for clean separation of the process during closure. 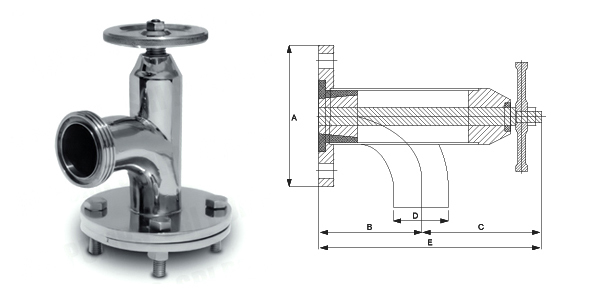 Tight shutoff is a characteristic of angular valves. Material Construction: AISI 304, AISI 316 & AISI 316L. Quality Tests: Metallurgical tests & Pressure Tests.